As a kid, I always looked forward to the Easter baskets my grandma sent. We lived a small town which only had a drug store to carry Easter candy. Think chalky tasting Russell Stover’s chocolates. My grandma lived in the big city…so she sent us See’s Candy Easter Eggs. These things were gold. They no longer carry the chocolate peanut butter egg. Now it’s the Chocolate Butter Egg and I’m sure it’s equally as delicious. This Easter, though, I was on a mission to bring back the peanut butter Easter egg. After a few recipe tests, it’s pretty close! If you are a sucker for peanut butter and chocolate and you have 20 minutes on your hands, you need to make these. Mix together butter, peanut butter and powdered sugar until thoroughly combined. Lay the balls on parchment paper and flatten them with your palm. Gently press in the sides of the flattened ball to make an ‘egg’ shape. Melt the chocolate chips and canola oil in the microwave for 30 seconds at a time until smooth. Place a frozen egg into the chocolate and use a mini spatula or fork to flip it over and then out of the chocolate and back on to the parchment paper. Repeat the process until all eggs have been dipped. Use a toothpick or sharp knife to draw around each egg so the chocolate will easily break off around the bottom of the egg. Freeze again for 1-2 minutes. Break off the excess chocolate. 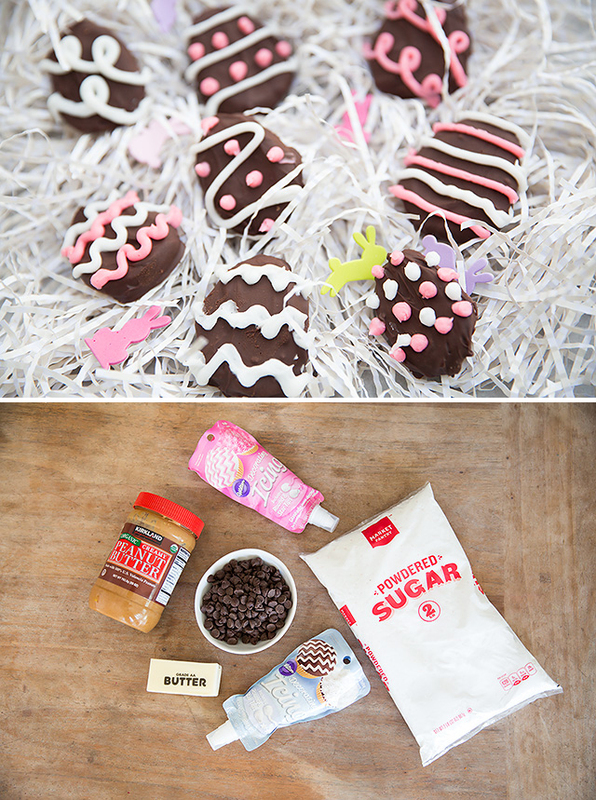 We decorated the eggs with pre-made frosting bags, but you can also serve them as is!